A beautiful girl who is Suzaku High's brightest student. She is one of the seven (original) witches. Urara's ability as a witch is Body Swapping. When she kisses a person she will instantly swap bodies with said person. There is a limitation though, if the person she kissed is already under the effects of another witch's power then the body swap won't happen. According to Miyabi Itou, Urara's ability is cataloged into Immediate Reaction. Shiraishi Gained that power by her own dislike of her life. After everyone in the Supernatural club loses their memories of Yamada, it is discovered she was in love with Yamada, which she now remembers as other people in the Supernatural club. She wears E-cup bras and lots of white underwear, but owns black ones as well. Yamada is the only person Shiraishi is willing to swap bodies with, i.e. kiss. 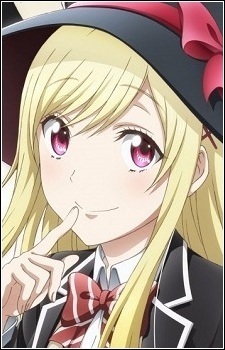 In a special report, Miyamura does an in-depth analysis of the witches based on his observation. In it, he mentioned Shiraishi and her power, "It's so awesome that I get to enjoy using this power! The risks of using are way too high, though. Shiraishi is pretty and nice, but she only kisses Yamada, which is a bummer. I want in on the fun!" Throughout the chapters, there are many hints that she has feelings for Yamada. She later admits this in Chapter 90, and the two of them begin dating after that. At the end of the manga, she marries Yamada.